I absolutely love mangos. Unfortunately it’s hard to find good ones here in the States. Maybe I am just too picky with fruit but I was spoiled with sweet tasting mango while in Indonesia. They were perfectly ripened and dripping with juice as you cut into them. Here they are mostly hard and green and have to ripen in your home before you can eat them. For me there is really no comparison. 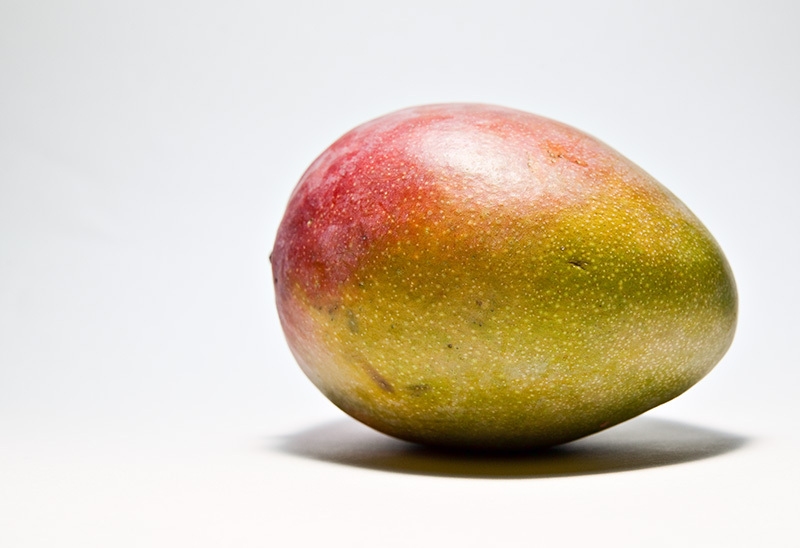 Worldwide there are hundreds of mango cultivars (varieties) worldwide. In Indonesia there are Arumanis, Gadung, Golek and Manalagi. Probably one of the biggest producers of mangos is India with over 50 varieties grown. In fact over half of the worlds mangos are cultivated in India. Mangos are good for you as well. They are rich in phytochemicals and nutrients, high in antioxidants like vitamins A, C and E.
I may just set a personal goal to see how many different varieties I can eat throughout the world. Now that would be quite an accomplishment. Until that time I will just have to settle on eating this one. Shooting notes: This was shot with a Canon 5DII and a single Canon 580EXII with a Lumiquest Softbox III attached. I kept the camera at fruit level and hand held the flash directly above the mango. Settings were: 1/125th sec @ f/9; ISO 100; 47mm.